Fondly called the Queen of Spices, cardamom evokes sweet memories of special masala chai blends and chawal ki kheer (rice pudding) for most South Asians. 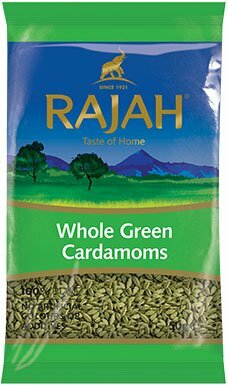 Like many other spices, cardamom was known for its medicinal properties in ancient times. Until 200 years back, most of the world’s cardamom came from the cardamom hills of southern India. Over time, this aromatic green pod was adopted by the Egyptians, Greeks and Romans for its medicinal and aromatic qualities. Its flavouring, medicine and religious offerings have also been mentioned in historical Indian texts. In fact, its sweet but subtle flavour still weaves through a wide spectrum of South Asian cuisines. Interestingly, it was the Arab traders who introduced cardamom to the West where it began to be used in sweet and savoury dishes. One of the most expensive spices by weight, green cardamom was initially farmed from the wild. Native to tropical regions such as southern India, the cardamom plant requires moist soil, in a warm environment, with filtered light. The seeds are usually slow to germinate and once planted their soil needs to be constantly monitored to maintain a good level of moisture. Farmers carefully clear the soil of shed leaves and mulch, preventing any blockage in the soil. The flowering stalk of the cardamom plant can grow up to a metre. Its flowers emerge a delicate white at the base of the plant before giving way to the aromatic green pods. These tender pods are delicately handpicked and dried under direct sunlight. They must be processed within 24-36 hours after being harvested to preserve their green colour which is a symbol of their freshness and flavour. To get the best flavour when cooking, pound a few cardamom pods in a pestle and mortar to release their flavour before you add them to hot oil. Left to steep in hot boiling water, the sweet but subtle flavour of cardamom can also be used to permeate your tea. Make sure to store your cardamom pods in a cool, dark space, away from direct heat and sunlight in a tightly sealed glass container. If the pods break open, the aroma and flavour of the seeds hidden inside will fade away. Apart from its beautiful flavour and aroma, green cardamom is used across South Asia for therapeutic reasons. It is known to heal infections of the teeth and gums. Many queasy tummies have been tamed with a simple home remedy of sucking on a cardamom pod. It is also used for throat ailments, lung congestion and digestive disorders, making it quite a handy spice in the kitchen and the medicine box.